The family friendly shows of yesteryear that taught a lesson have been replaced with over-sexualized shows exploiting immorality. Hollywood and television shows promote a specific agenda which finds itself at odds with Catholic moral teaching. Have you noticed that most shows include an active homosexual or bi-sexual couple? Or highlight the fornicating co-workers? Or convey that adulterous relationships are alright? Sometimes the shows undermine the Church by making jokes at the expense of the pope or priests, or challenge certain hot topic issues like in vitro fertilization or abortion. While these situations are realities in everyday life, by highlighting them, the viewing public becomes de-sensitized to these moral issues. Take for example one television show I recently saw in which a young boy was being cared for by a single lady. When another female co-worker visited her at her house, the boy inquisitively asked, “Is she your girlfriend?” This is how commonplace or ingrained these ideas have become. We no longer give such situations a second thought, but presume promiscuity. Over the past several months I have questioned whether or not I should be watching television shows that glorify sin, death, and sexual perversity. It is a conversation I have had with my spiritual director, and it has been a recurring question in recent weeks in my own prayer. 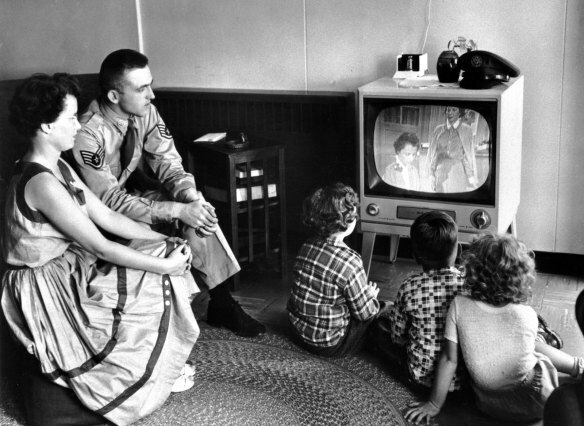 Besides the question of immorality in the programming, perhaps other questions are just as pertinent: How much time do I spend watching television? How has my spiritual life been lately? What else could I be doing with my time? Television becomes an easy tool of procrastination, especially if one has a Hulu account—television on demand. Quite often many networks even air weekend marathons of certain shows. Before one realizes it, they have spent three or four hours (or more) watching a series while other tasks fall to the back burner. The reading, studying, or praying one should have done, is put off until later, maybe even tomorrow. The purpose of this reflection is by no means to tell readers they should not watch television because their soul may be at stake. No, that is not my intention, rather, the purpose is to raise awareness about the moral depravity and encourage each individual to examine their own conscience. Since we have become so de-sensitized to immorality on television, perhaps some people have never thought about these moral questions, specifically how do I reconcile my Catholic beliefs with what I am watching? There is an old prophesy (most likely urban legend) that states: “Every American would have a black box in their home through which the devil would enter.” This prophesy has been attributed to Sts. Elizabeth Ann Seton, Frances Xavier Cabrini, and Padre Pio. They all probably did not say this, and maybe nobody actually said this, but the concept is, at the very least, intriguing. Many homes have a big, flat, hi-definition television which they gather around nightly, sometimes even taking their evening meal together in front of the television.